Today we had Nika's ABR, which is a sedated hearing test and the most accurate way to test hearing. We decided to have this done since regular hearing tests showed mild hearing loss and she was flat lining on the tympanogram. Nika has such an easy going personality ... the nurses are always so in love with her. She doesn't cry for blood draws and she didn't cry during the three attempts to place an IV in her arm today. Sigh. In fact, she whined more about tape being pulled off of her than she did needles being stuck in her arm. While her passive/accomodating personality, which I believe comes from being in an orphanage for two years, is good for medical procedures, it really sort of worries me that she has no reaction to pain, especially in a medical setting. Although, she seems to have no problems crying when her sister pushes her around. So the ABR showed no hearing loss. I was really surprised that she didn't have at least mild hearing loss, so this is great news! The doctor did note that while asleep and laying on her back, her oxygen level got really low when her head was midline. 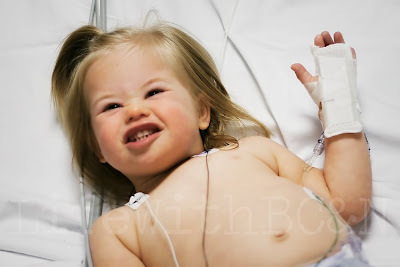 However, when they turned her head to the right or left, her oxygen levels went back up. I am not super concerned about this since she sleeps on her tummy with her head turned to the side. I will, however, be talking to the ENT about this to get feedback. Interesting the things we find out, eh? Could she be any stinkin' cuter??? AND, she has a laid back, easy going personality to boot??? Send that girl this way! I LOVE the cheese smile. I smie every time I see her do it. Well, she is just too stinkin cute! Glad to hear the ABR went fine! Angela has not complained about medical procedures (including blood draws or shots) since she was TINY! For her, it's all about conditioning. The nurses always ooh and aah about how great she is, when they have typical kids who it takes 5 adults to hold down. While I'm glad medical procedures are easy, it bothers ME too! For Angela, it has everything to do with the fact she's been conditioned to it because of all the things she's had done. To me, that is sad! SO glad the ABR came back normal! I am hoping the same for Kennedy. Her tympanogram was flat too. For Angela, it has everything to do with the fact she's been conditioned to it because of all the things she's had done. To me, that is sad! This is the same for my eldest son, who was born with a Cleft lip and palate. We wouldn’t know he had sore ears until they burst, wonted use pethidine after his bone graft surgery….ugh it really bothered me. So glad it all went well. I’ve never heard of, being sedated for a hearing test. dang i could eat her up! That is great that she has no hearing loss!!! Ella is the SAME way about pain. Nothing really hurts her, for example when she had her tonsils and adnoids out nothing!! BUT, if Hunter pushes her or trips her etc, the waterworks start. I'm convinced she cries when her FEELINGS are hurt. I too have major concerns about that, how will I know if she is ever really hurt?? Also, Ella does the O2 thing when she lays down on her back. Goes into the 70's, she had the sleep study, no apnea. They said it's just something she does, probably has all her life and they are not concerened about it. It sure is interesting the things we learn!!! Such a cute little bug!! I'm glad you got good results! I don't know about her laid back personality/orphanage - Aleena is JUST LIKE THAT! She doesn't cry for her immunizations or for blood draws. She's as good as can be! She didn't cry when she got stung by a bee. It takes A LOT to make Aleena cry! When she broke her collar bone recently, she continued to play for the next 24 hours with no hint of a broken bone! Nika may just have a very high pain tolerance . . . and I agree - it IS scary! My experience so far, is that the 2 times I have been to the ER with Aleena, I have to convince doctors that I am not over-reacting and to take our concerns seriously because Aleena does not act like a typical child in pain! The stuff that makes most kids cry, causes Aleena to stick out her lip. If she is CRYING, the pain is serious!!! Nika is soooooo cute! Congrats on the great results! Just wondering: Do you call her Nika in every day life or just on your blog? That was her name in Europe, right? My 5 year old has never cried for a shot, not even when he was an infant. The only time he cried was when they had to remove his pants once to give him one in his thigh, he freaked out, he said, "that's not how your supposed to do it, PUT MY PANTS BACK ON"
He does have sensory issues and seems to not be bothered/sometimes even seems to like pain. But hurt his feelings and forget it he cries like a baby!! And like everyone else, I agree she is so darn cute, I bet you just eat her up!